"From Cape to Cairo, Africa must stand together as never before to create a sweet chorus singing the same song in perfect harmony. The 2010 FIFA World Cup must be Pan-African in word and deed as South Africa stages a tournament that inspires all of Africa." - Dr Irvin Khoza, Chairman 2010 FIFA Organising Committee. The 2010 ball has started rolling in full force and the World Cup is right on our doorstep. But this World Cup does not belong to South Africa alone, it belongs to all of Africa. With less than five months before the opening match on 11 June at the Soccer City Stadium, we must all stand together to make it the greatest showpiece that Africa can offer. So, let us as South Africans inspire the whole of Africa by being proudly African. Let us take action to help build up excitement through things that tell the world we are proud to be African. The 2010 National Communications Partnership (NCP) was formed to oversee and drive messages for the 2010 World Cup. The role of the NCP is to inform the public about 2010 events, market South Africa and inspire a sense of pride and unity among the South African public. As the eyes of the world are upon us, we can support the NCP's efforts in many ways. We can start by flying our beautiful flag with pride. The NCP plans to hand out more than 47 million South African flags leading up to the start of the World Cup. "Our national flag is a powerful symbol of unity and pride, and we would like to play our part by encouraging South Africans to proudly fly the flag ," says Margaret Dingalo, Stakeholder Relations Manager for the IMC. We can also welcome the world by doing the diski dance. At the launch of the Football Friday campaign, Deputy President Kgalema Motlanthe urged all South Africans to learn the diski dance as part of welcoming the world in a celebratory way. Like the vuvuzela and the makarapa (a decorated hard hat), the diski dance is a first for South African football. The dance borrows much of its style from the 'beautiful game'. The 2010 World Cup mascot, Zakumi, is set to bring a sense of fun to the World Cup. As the build-up to the World Cup gains speed, Zakumi, will help to fire up support and enthusiasm. So support and encourage him. He will be spotted throughout the country talking to people and encouraging them to support the World Cup. 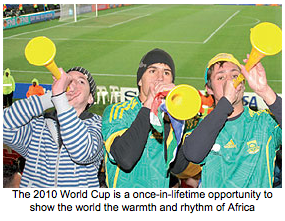 The 2010 World Cup is a once-ina-lifetime opportunity to show the world the rhythm and warmth of Africa. So don't miss out - choose to be part of it all by being a champion for our country and for Africa.